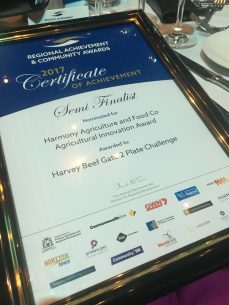 Harvey Beef Gate 2 Plate Challenge was presented as a Semi Finalist in the prestigious Harmony Agriculture and Food Co Agricultural Innovation Award, by The Hon. Stephen Dawson MLC, Minister for Environment & Disability Services at the 2017 Western Australian Regional Achievement and Community Awards Presentation ceremony held at the Hyatt Regency Perth on Friday 20th October. The Awards were hosted by Noel Brunning, News Presenter, GWN7 and over 500 guests gathered from across the State to celebrate regional Western Australia’s high achievers and community contributors. Harvey Beef Gate 2 Plate Challenge is a unique cattle competition with a 100% commercial focus. Statistics give producers a better understanding of cattle performance, facilitating the development of stronger herds and profitability. Dr John van Bockxmeer was later announced as the Department of Primary Industries and Regional Development Overall State Winner. The Awards night culminated a tremendously successful year with over 320 nominations received from across regional Western Australia. Read more about the awards and the winners here.